The question whether the U.N. Relief and Work Agency for Palestinian Refugees in the Near East (UNRWA) has successfully reintegrated Palestinian refugees into the normal life of the Middle East has long been a central bone of contention. Anxious to fend off criticism by the refugee population and by various political factions, UNRWA officials mince their words and disguise their actions in this regard. UNRWA publications and documents tend to discuss reintegration without ever using the term as if the agency was not required by its original mandate to work for "the reintegration of the refugees into the economic life of the Near East, either by repatriation or resettlement." This evasiveness is not difficult to understand: If UNRWA has successfully reintegrated the refugees into the economies of the host countries and the region, as it may have well done, what justification is there for its future existence? Indeed, since the huge labor force it has accumulated in the course of its work may never permit it to disband, UNRWA seems to be searching yet again for a new reintegrative task that would give it a new sense of purpose. With the establishment of permanent homes for the refugees, UNRWA shifted emphasis to education as an alternative project of reintegration. By 1966, the agency's expenditure on education had outstripped that of food rations and amounted to about 34 percent of total expenditures. Many of the 1948 Arab refugees from Mandate Palestine left behind their belongings and expected to return to their homes within days or weeks. Many moved in with relatives or rented temporary accommodation in towns. Those who had nowhere to go squatted under trees in the countryside or on the outskirts of towns, as close as possible to their region of origin. Most of them were villagers, often clusters of relatives and neighbors, who camped together for mutual protection. Within weeks, the International Red Cross and other welfare organizations began to operate, providing tents, food, and first aid. The United Nations Relief for Palestine Refugees agency (UNRPR), set up in 1948, coordinated these activities. But in 1950, UNRPR was succeeded by UNRWA, which rapidly became the chief purveyor of aid and welfare to the refugees, displacing almost all other welfare organizations. As hopes for the refugees' speedy return faded, the makeshift camps gradually became permanent features in the landscape. The realization that the refugees would not be going back to their homes in the foreseeable future and that various proposed schemes to resettle them in the host Arab countries were coming to naught caused UNRWA to shift its emphasis. Housing and education became the major goals. Permanent homes would induce the refugees to settle into their new surroundings while education would hopefully facilitate their integration either into the local economy or elsewhere in the Arab world. In the following years, UNRWA devoted a growing proportion of its effort and budget first to refugee housing and then to schooling which, after peaking in the 1980s, developed at a slower pace. Planning for the establishment of permanent camps began in 1952, and large scale implementation began from 1955 onward. Streets were laid out on a grid, and UNRWA services were located on the margins. The land was parceled into plots of between 70 to 100 square meters on which concrete or mud cubicles of three by three meters (approximately ten by ten feet) were built. These structures barely kept out the cold; they had roofs of corrugated tin or asbestos sheets but neither floors nor glazed windows. Each household was assigned a plot with its hut with bigger families given a slightly larger dwelling. At first, the refugees put up some resistance, fearing that permanent dwellings would tie them down and weaken their determination to return to their former homes. UNRWA officials told this author that they persuaded the camp-dwellers that the concrete cubicles were being built for reasons of economy only: It was simply cheaper to maintain houses than to replace tattered tents year after year. In order to stress the temporary nature of the dwellings, they called them "shelters" (malja), and the camp inhabitants soon adopted the term themselves. Of course, both camp-dwellers and UNRWA officials knew that the new homes were there to stay, and while the residents welcomed the improvements, they could not publicly approve of them. The administrative decision to replace the refugees' flimsy tents with more permanent housing and to attach a plot of land to each hut succeeded in turning most of the camps into permanent urban or suburban quarters within a decade. By the 1960s, this process had run its course: The camp-dwellers had built up their plots and become the de facto owners of real estate, which they sold freely on the housing market. The project was so successful that UNRWA rapidly lost control of its own camps, occasionally making feeble but unsuccessful efforts to require residents to seek its permission for the sale of homes. By the end of the 1960s, UNRWA ceased to intervene in sales of houses. Even in the 1960s, the camp population did not exclusively comprise the original 1948 refugees; there was a continuous stream of new arrivals. Data from a 1968 study of the Jalazon refugee camp, situated north of Ramallah in the West Bank, showed half the camp's households arrived from 1950 onward. Some people moved from outlying camps to ones situated close to a larger city in order to improve their chances of employment, but most of the newcomers, while officially designated as refugees, had never been in a camp. They typically had been living in towns and their circumstances had changed. Some had lost their livelihood, others had grown old and weak or had no one to take care of them. They moved into a camp because there were advantages to be gained: They paid no rent and no municipal taxes and their water supply and sanitation were free. While all designated as refugees had access to UNRWA services, the camp-dwellers were better placed to make proper use of them. Most health clinics, for instance, were located in camps, and their free services were available mainly to the inhabitants. Monthly food rations, which the heads of refugee households had to collect personally, were distributed in camps. From 1955 onward, the plots of land became an added inducement to move into camps. As a result, between 1951 and 1967, the camp population in the West Bank grew by two thirds, from 94,000 to 144,000, while the total West Bank population grew by only 12 percent—from 768,000 in 1951 to 871,000 in 1966. The refugee camps developed rapidly into permanent settlements. They are today among the better lower-class urban quarters. Most camps have become fully integrated into nearby cities and receive municipal services, such as piped water and sewage disposal, with the homes making an important contribution to the scarce urban housing stock. While the majority of the camp-dwellers are still the descendants of refugees, affluent camp-dwellers generally move to other city quarters. The camp-dwellers have invested capital in improvements and built up not only the plots of land first allocated to them but have also often encroached on public space, so that the floor area of most homes now exceeds the original 100 square meters. The original malja have been either dismantled or turned into storage space. Most houses are solidly constructed, and many have two or more floors. The residents have also established close-knit social networks in this environment and do not wish to leave their property, livelihoods, and friends in order to be resettled and thus once more begin a refugee existence. With the establishment of permanent homes for the refugees (and others who moved to the camps), UNRWA might have decided that it had completed its task. Instead, it shifted emphasis to education as an alternative project of reintegration. Education is, of course, a natural adjunct to reintegration. A school system that would provide the refugee children with a good education and prepare them for life in a modern economy seemed clearly in line with UNRWA's mandated goals. What was necessary was to develop a school system to equip the younger generation of camp-dwellers for full participation in the economic and cultural life of the host country and the region. To accomplish this, UNRWA reduced its activities in other fields, such as the distribution of food rations, social assistance, and medical care. By 1966, the agency's expenditure on education had outstripped that of food rations and amounted to about 34 percent of total expenditures. In 1981, it discontinued providing food rations altogether, and in 1985, education-related outlays peaked at 67 percent of UNRWA's total expenditures and then stabilized to about 55 percent. 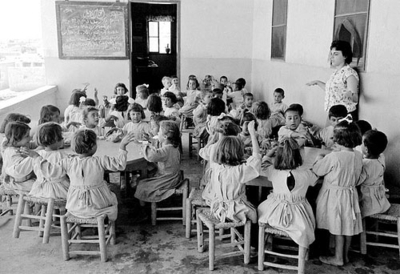 Although the first Palestinian intifada of 1987-92 brought back some food distribution, to this day UNRWA devotes a major part of its resources and efforts to education, and the majority of its employees are teachers. The literacy rate of the original 1948 refugees was about the same as that of the rest of the Arab world with approximately 50 percent of the adult men and 20 percent of the women functionally literate. UNRWA hoped that schooling could at least give the children of the refugees a head-start in life. It put great efforts into building up a good system of elementary schools and also established a few vocational schools and three teachers' colleges. As measured by budget allocations, education has become the single most important activity for the organization. Today UNRWA employs some 23,000 teaching staff in 700 schools with nearly 500,000 pupils, half of whom are girls. This latter is a quite remarkable achievement when compared to surrounding Arab states. Since 1960, the schools comprise nine grades, but UNRWA was unable to set up a system of secondary schools, and the standard of its ten vocational schools is mediocre. UNRWA has not been able to keep pace with the growing demand for new schools. Due to financial constraints and the demand by Palestinians to increase staffing and thereby provide employment, it has been slow in building new facilities. As a result, most school buildings are dilapidated and actual instruction proceeds in two, or even three, shifts. Salaries of UNRWA teachers, which were in the past higher than those in state schools, are now approximately the same in both systems. This might indicate that conditions are right for handing over the running of UNRWA schools to the states of the region (as well as the Palestinian Authority). This would permit the agency to transfer more than half its manpower to the respective states and the PA and would represent an even fuller level of reintegration. It would also allow UNRWA to move on to new goals. The grandiose and expensive development projects envisioned by UNRWA's founders to help resettle refugees in the host countries never materialized, and the agency was forced to adjust its operations to the changing political situation and to the conditions within each of the host countries. The most important changes took place gradually when UNRWA ceased to be a purveyor of emergency assistance and became a permanent service organization, extending its range of services to numerous walks of life, such as education, social welfare, water supply, and sanitation. Gainful employment was to be provided by recruiting its staff from among the refugees. Although only Jordan out of all host countries gave refugees on its soil full citizenship, the refugees' freedom of movement and employment (as distinct from land ownership) was never seriously restricted with the exception of Lebanon where they are barred from numerous professions. This permitted them to seek employment and to become economically independent and to contribute to the economy of the host country. This relative freedom can be partly attributed to UNRWA's presence: The agency brought in a constant flow of funds, so that the host governments looked favorably upon it and allowed it to take care of the refugees. The host governments were thereby released from dealing directly with the refugee problem, and therefore, did not impose special controls on the movement and employment of refugees. Male refugees were rapidly absorbed in the labor market, and by the 1960s, their rate of employment was nearly the same as that of the rest of the population. They did, however, occupy the lower rungs in the economy, and their per capita income remained about 40 percent below the average. Men went to work, generally outside the camps, finding employment in construction, small industrial enterprises, and service industries. Although most of the refugees had been villagers, few engaged in farming since nearly all Arab states restrict Palestinian refugee property ownership. In a few outlying camps, some men did become farm laborers, but many more found better paying employment as migrant workers in other Arab countries and sent remittances to their families back home. As work of some kind was usually available, most refugees never relied heavily on economic assistance, such as food rations and welfare payments, provided by UNRWA. While these services were used and appreciated by the camp-dwellers, even in the 1960s, they provided just one fourth of their income and later became even less significant. Only in households without a breadwinner, usually those headed by women, did economic assistance become critically important. A sizable number of camp residents found jobs with UNRWA, which hired almost exclusively from the refugee population, and the agency became the largest employer in the West Bank and Gaza Strip. Some UNRWA employees worked in their own camps and became the largest employed group there. While these employment developments helped keep the camp residents from sinking into poverty, they sowed the seeds of the problem that lies at the heart of UNRWA's dilemma today. There are basic organizational reasons why UNRWA stays in business. Primarily, it behaves like any normal organization and thus seeks to continually increase its resources and extend its life span. With some 30,000 employees in 2012, UNRWA is probably the largest nongovernmental organization in the region. It is certainly the largest organization in the U.N. framework. From its early days, it fought for exclusive control of its fields of activity, which have changed over time, and is still doing so. Moreover, UNRWA's early policy to employ only those deemed refugees and to gradually open up the higher ranks of officialdom to them, has given the local staff increased power, which they use in order to obtain more jobs and better working conditions, including greater job security. They have been so successful that the perpetuity of UNRWA is today very much taken for granted. By the 1960s, the initial devotion to the service of the refugees by local employees had been diluted by career considerations with many of the local employees staying in their jobs throughout their working lives and enjoying tenure and retirement payments. It is thus in the staff's interest to keep the organization that provides their livelihood going for as long as possible. Small wonder that they oppose any political settlement that could put UNRWA out of business and consistently support the refugees' "right of return" to their former homes in what is today Israel—a demand the Jewish state categorically rejects. With UNRWA's U.N.-appointed leadership convinced of the necessity of keeping the agency functioning forever and securing the livelihood of its employees, its major function has become raising funds for the continued operation of this huge organization. This, in turn, requires the continued promotion of the image of a suffering, impoverished, and oppressed refugee population while hiding the fact that the descendants of the refugees have effectively been integrated into the economies of most host societies (apart from Lebanon) and the Palestinian Authority. According to the recent UNRWA Medium Term Strategy 2010-2015, the agency today faces three strategic challenges: It "must be ready to adapt to new field realities" (i.e., to prolong its existence); it must deal with "continued high staff costs" (i.e., the number of employees is expected to increase); and it must cope with "the risks to UNRWA's performance … from continued underfunding" (i.e., declining standards of service). What is most striking is that the authors of the document do not even raise the possibility of phasing out the organization. With large-scale emergency food distribution mostly a thing of the past, refugee housing a non-issue, and new educational infrastructure projects unlikely to proceed, has UNRWA reached a dead end? Or can it reinvent itself? It could, if it set itself up as mediator in future negotiations between Israel and the Arab states on the issue of compensation of Palestinian refugees. Refugees who are not compensated for their losses may pass their resentment to future generations. This is best illustrated by the aftermath of the 1921-22 war between Greece and Turkey. As a result of the agreed-upon population transfer, 1.2 million Christian Turks became "Greeks" who lost their homes and property, and 350,000 Muslim Greeks became "Turks," some of whom were resettled in the homes of expelled Christians. Fifty years after their arrival, refugees from Anatolia who had settled in the port of Piraeus still thought of themselves as refugees. They still considered themselves Anatolians, had little respect for the local Greeks, and many still spoke Turkish among themselves. While the Greek state had housed them in state-owned makeshift accommodations, no one had ever compensated them for their losses. The refugees resented both the Greek and the Turkish authorities for having left them in the lurch. This resentment spread throughout the refugee populations in both countries, has poisoned relations between the countries, and flares up at the slightest pretext. Bitter memories feed into the sporadic disputes between the countries. Although statesmen have tried from time to time to improve relations, the two peoples have not made their peace. This brings us back to UNRWA. There are some indications that the agency is already taking practical steps to focus on this issue. UNRWA's leaders have repeatedly announced that the organization intends to remain in business as long as the refugee question has not been settled. In her 2009 speech to the Security Council, Commissioner-General Karen AbuZayd suggested that UNRWA should join "negotiations that are inclusive and balanced, that allow for refugee representation, and address … the question of Palestinian refugees in a manner consistent with their rights." At the same time, the organization is keen to project a new image: no longer that of a staunch defender of Palestinian refugees' rights, but rather that of an impartial mediator empathic to Israel's fears of being inundated by Palestinians returning to their ancestral homes. A step in that direction may be UNRWA's continuing efforts to introduce the study of the Holocaust in its school curriculum. Should UNRWA's leaders decide to undertake this major task—to negotiate on behalf of the Palestinian refugees an agreement that would compensate them for lost land and life chances— the organization would gain a new lease on life. At the same time, while such an agreement could assuage the bitter feelings of the refugees and pave the way for a peaceful settlement of the Israeli-Palestinian dispute, the entrenched local staff would fiercely oppose the project, unless their own futures were first ensured. Emanuel Marx is Professor Emeritus of Social Anthropology at Tel Aviv University. He has worked among Bedouin in the Negev and in South Sinai, an Israeli new town in Galilee, and Palestinian refugee camps in the West Bank and Gaza. See, for example, Gina Benevento, "Letters to the Editor: Palestinian Refugees," Azure, Spring 2006, p. 3. U.N. General Assemble (UNGA) res. 393 (V), Dec. 2, 1950, (1). For purposes of this article, reintegration is defined as "a process in which the refugee acquires ever expanding and more diversified social networks in the new environment, especially as related to the essential needs of establishing a home, finding suitable work, and obtaining a decent education for his or her children," in Emanuel Marx, "The Social Worlds of Refugees: A Conceptual Framework," Journal of Refugee Studies, Jan. 1990, p. 196. Yoram Ben-Porath and Emanuel Marx, Some Sociological and Economic Aspects of Refugee Camps on the West Bank (Santa Monica: Rand, 1971), p. 8. Based on fieldwork by the authors in the West Bank in 1968. Interview with UNRWA district manager, Jalazon Camp, 1968. Ben-Porath and Marx, Some Sociological and Economic Aspects, pp. 9-11. Michael K. Roof and K.G. Kinsella, Palestinian Arab Population: 1950 to 1984 (Washington, D.C.: Bureau of the Census, Center for International Research, 1987), p. 26. Author interviews with residents during fieldwork in the Gaza region, 1987. Ben-Porath and Marx, Some Sociological and Economic Aspects, p. 61, table 10. Maya Rosenfeld, Confronting the Occupation: Work, Education, and Political Activism of Palestinian Families in a Refugee Camp (Stanford: Stanford University Press, 2004), p. 112. Ben-Porath and Marx, Some Sociological and Economic Aspects, p. 37. "UNRWA in Figures," UNRWA, Amman, Jan. 1, 2011. UNRWA Education Reform Strategy, 2011-2015, UNRWA, Amman, Mar. 2011, pp. 11-2. Recently however, King Abdullah has begun a process of stripping a sizable number of Palestinians of their citizenship. See Mudar Zahran, "Jordan Is Palestinian," Middle East Quarterly, Winter 2012, pp. 3-12. Laurie A. Brand, "The Politics of Passports: Palestinian Legal Status in Arab Host States, 1948-86," in Reeva S. Simon, ed., The Middle East and North Africa: Essays in Honor of J.C. Hurewitz, (New York: Columbia University Press, 1990), pp. 26-42. See David Schenker, "Palestinian Refugees Languish in Lebanon," Middle East Quarterly, Fall 2012, pp. 67-74. Diala Khalaf, "Palestinian Refugees in UNRWA Camps in Arab Neighboring Countries," Palestine News Network, May 24, 2012; Abbas Shiblak, "Residency Status and Civil Rights of Palestinian Refugees in Arab Countries," Journal of Palestine Studies, Spring 1996, p. 44. Ben-Porath and Marx, Some Sociological and Economic Aspects, p. 54, table 9. "Overview," UNRWA website, accessed June 26, 2012. UNRWA Medium Term Strategy, 2010-2015, UNRWA, p. 6, accessed June 29, 2012. Renée Hirschon, Heirs of the Greek Catastrophe: The Social Life of Asia Minor Refugees in Piraeus (New York: Berghahn, 1998), pp. 23, 28, 246. Baskin Oran, "The Story of Those Who Stayed: Lessons from Articles 1 and 2 of the 1923 Convention," in Renée Hirschon, ed., Crossing the Aegean: An Appraisal of the 1923 Compulsory Population Exchange between Greece and Turkey (New York: Berghahn, 2004), pp. 103-4. Reuters, Aug. 20, 2009; Jewish Telegraphic Agency, Sept. 10, 2009; BBC News Aug. 31, 2009.